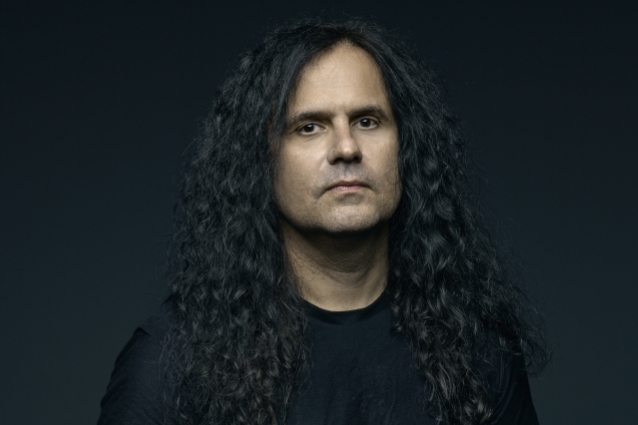 In a recent interview with Finland's Rauta, KREATOR frontman Mille Petrozza was asked how he maintains his energy level considering he's not 25 anymore. He responded (see video below): "I guess the music keeps you young and fresh. And being disciplined about poisoning your body anymore; I don't do that anymore — I used to, when I was really young. Nowadays it's all yoga and health food and veganism. I wanna keep doing this until I'm very old. I guess that's the key — just try to focus; focus on what's important. And to me, the older I get, the more clear it becomes that the reason why I started this was the music and not abusing your body, not doing anything that's unhealthy and not overdoing the partying and just focus on the music. And that, to me, was what always was the most fun anyway. So I'm totally happy." As Petrozza and other traveling performers would attest, being a touring musician and maintaining a healthy lifestyle aren't exactly compatible: spending hours a day on a bus, living out of suitcases and staying in hotels means that staying healthy is a constant struggle. Still, Mille is reluctant to force his lifestyle on to some of his younger counterparts. "You should find out by yourself," he said. "I'm not gonna say, 'Do this or that.' Everybody should just do whatever they want — that's my philosophy. Just go out and do stuff and find out for yourself. You might think that… When you're young, you think you're invincible — you're strong and you can do drugs and you can drink everything, whatever. And once you get older, you just feel, like, 'Man, it's not worth it.' When I drink, I have a hangover the next day, so two days are gone. [Laughs] It's, like, 'No.' [Laughs] Do whatever you want, but just be careful. I don't wanna preach — I don't wanna push my lifestyle on to other people."